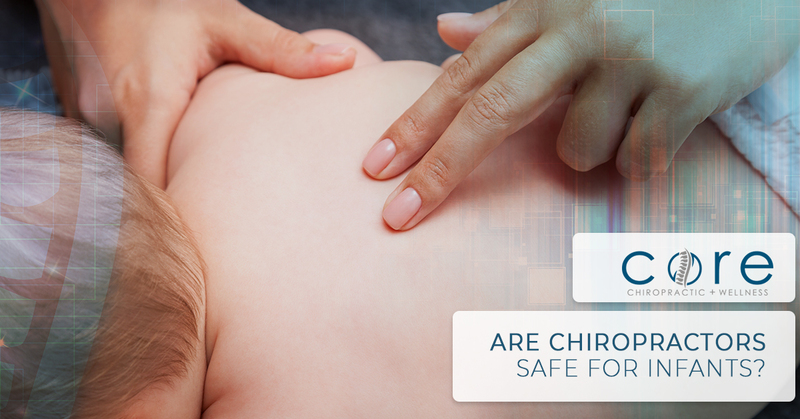 Chiropractic care is beneficial for adults, but is it safe for babies? If you have been treated by a chiropractor before, you know the relief you can feel when you are suffering from acute and chronic pain brought on by sitting too much and not moving enough or health concerns such as migraines and sciatica — chiropractic care provides a long-term solution to your aches and pains, but is it appropriate for infants? Your body is amazing in the voluntary and involuntary functions it provides every day — but when there is an imbalance, it can greatly affect of quality of life. At Core Chiropractic and Wellness, we are here to address your spinal and nerve issues to help get your body back in balance. Join us in today’s post as we examine if there is a role in chiropractic care for infants. It makes sense why adults would see a chiropractor, but why would a brand new baby need chiropractic care? Babies don’t have back pain or get migraine headaches, so is a chiropractic treatment warranted? Why would an infant get a chiropractic adjustment? What is at the root of birth trauma? What are common symptoms of birth trauma? Now that we can understand why a chiropractic treatment may be warranted for infants, is it safe? Can infants safely get a chiropractic adjustment? Yes, chiropractic care is advantageous for infants with adverse pediatric chiropractic adjustments being relatively nonexistent — an estimated one in 250 million adjustments. This is a gentle and safe way to address birth trauma spur healing and wellness in your baby as they develop. What does typical infant chiropractic look like? Light pressure is applied to the baby or an instrument is used during an adjustment. Like any other patient, the baby is examined and is usually adjusted in a comfortable position within the parent’s or caregivers lap. Often times the baby is so content, they’ll fall asleep during the treatment! What are the benefits to pediatric chiropractic adjustments? Whether your baby has colic or tummy issues, a visit to the chiropractor may be beneficial. Chiropractic adjustments are safe for babies within the first weeks following birth and they address issues for infants who were birthed naturally and by C-section. Chiropractic supports a babies natural abilities to recover after birth. Light manipulations after birth can better ease strain and tension and address any birth trauma concerns. Soothe colic with chiropractic adjustments. Colic is a very frustrating condition experienced both by the baby and parent and is often linked to GI upset followed by indigestion and gas. As the gas builds, it can cause pain and bloating in your baby. With the assistance of an adjustment, they can stimulate your baby’s body and get things moving to better push things through and out. In this post, we’ve explored birth trauma and the safety of pediatric chiropractic. There are so many other benefits to examine, so look for additional information in a follow-up post. To schedule a chiropractic treatment for your little one, connect with our office today!